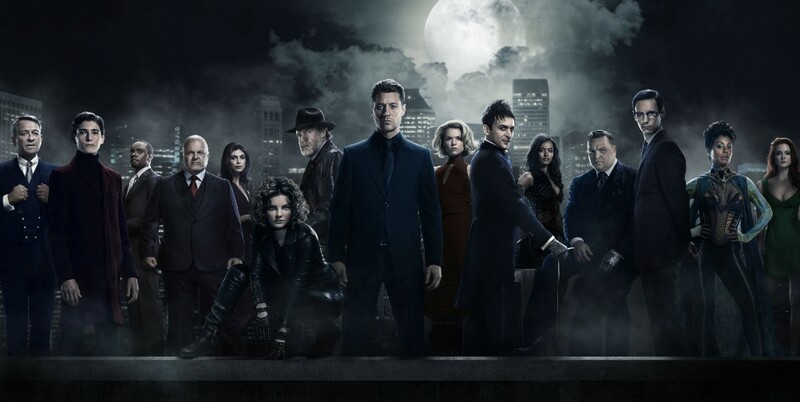 Details are made known about the Gotham series finale that time-jumps 10 years ahead, which includes it will feature Batman, Catwoman, the classic-looking Penguin and more. The Gotham series finale airs Thursday, April 25. Regarding Batman, David Mazouz will provide the voice and the face, but another actor will be used in the cape and cowl to fill the 6' 4" frame. At the recent Television Critics Association, the first footage of the Gotham Batman was shown off, but it isn't available online. Update: It is further confirmed that Batman will be used throughout the entire last episode and won't just be a one-time appearance in one scene. Camren Bicondova also confirms Selina Kyle will be seen as the fully-realized version of Catwoman when the show jumps ten years into the future. Robin Lord Taylor previously confirmed the classic-looking Penguin will be coming and says he is the only actor to have worn a fat suit. "We jump forward at the end of the season so we actually get a glimpse of the Penguin that we all grew up with," he recently told The Wendy Williams Show. "I was talking to our costume designer I was saying like, I don’t want him to be like a cartoon, like, I was thinking like the blueberry girl from Willy Wonka! I didn’t want that kind of look,’ he explained. ‘So we went with something a little more monstrous, there’s a hunch on his back …He’s becoming a monster in this season." The Jim Gordon and Barbara Kean storyline will wrap up nicely. Cameron Monaghan doesn't appear to be the actual Joker, but more of a proto-Joker (it sounds like WB wouldn't allow the use of the Joker). Killer Croc was wanted for the series, but they couldn't get him. A similar character is teased for later on in the final season. In related news, a lot of details have also been made known for the Gotham prequel series Pennyworth. Gotham airs Thursdays at 8pm EST on FOX.